Place Enmax Centre, Lethbridge, Alta. Watch every Blades road game at Shoeless Joe’s Sports Grill in Saskatoon! 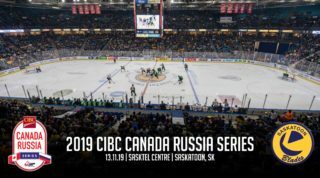 Tonight… The Saskatoon Blades wrap up a 4-game road trip in their 1st meeting of the season with the Lethbridge Hurricanes. 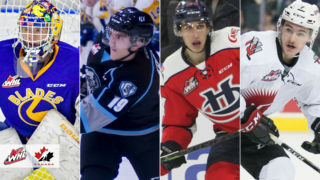 Tonight marks the 6th game the Blades have played in the last 8 days, 5 of which have been on the road. 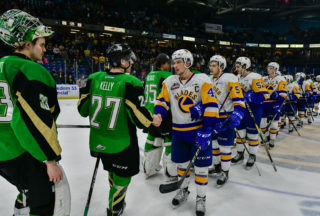 Saskatoon is coming off a 3-0 win last night in Calgary, Dorrin Luding made 42 saves in goal, Kirby Dach (5), Logan Christensen (1), and Michael Farren (1) all scored for the Blades. 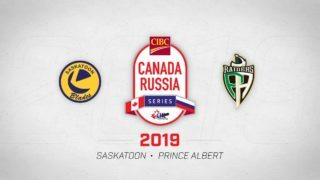 Taylor Ross scored the lone goal for Lethbridge in a 5-1 loss last night to the Prince Albert Raiders in Lethbridge. Head to head… Last season the Blades went 2-2-0-0 against the Hurricanes. This is the first of four meetings this season; they’ll meet again in November and twice more in February. Saskatoon enters with a +10 goal differential while the Canes are at -5. 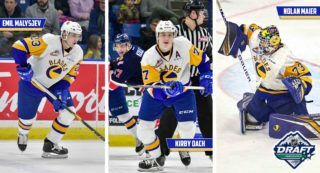 Who’s hot… Kirby Dach sits tied for the league scoring race with 5 goals and 13 points through 7 games, including 6 in his last 3 games. Linemate Eric Florchuk scored twice on Wednesday and added an assist last night giving him 8 points on the year. Veteran d-man Dawson Davidson has 7 points in his last 4 games, 10 points in total on the year leading all defensemen in league scoring.